Come and experience a life-changing Christmas holiday by opening your mind and participate in this meditation and yoga retreat! This amazing retreat was created for a serious practice of yoga, breathing techniques sessions, and relaxing meditation, all backed up by delicious prepared food in the beautiful area of Andalusia, the heart of Spain. Re-invent yourself by spending your Christmas holiday in the glorious Spain with this retreat! On this retreat, you will spend your nights in the cozy B&B Yoga Center Casa Bhakti. The place is fully equipped for guests with en-suite double and twin rooms. The rooms have no television and the venue is entirely smoke-free. In addition, there is a swimming pool (not heated) that you can use during hot days. Some books are also available to keep you intellectually and spiritually entertained in the venue. Ping Pong table and free Wi-fi are also available. However, B&B Yoga Center Casa Bhakti recommends you to focus on other activities. On this retreat, you will experience meditation sessions, talks on Vedanta (Indian philosophy), and Hatha yoga. The teachings are based on the 5 basic principles of yoga; proper breathing, proper exercise, proper relaxation, proper diet, and proper thinking (meditation). These principles come from a classical yoga which is also known as Integral yoga that originated in ancient India thousands of years ago. 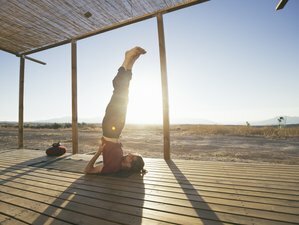 For this vacation, you do not need to be an experienced yogi to participate. However, it is recommended that first-timers should collect some basic information on yoga, breathing techniques, and meditation before attending. Loic hat schon immer gern dafür gesorgt, dass die Leute um ihn herum gesund und glücklich sind. Er hat Yoga und Meditation gelehrt und verfügt über viel Wissen in westlicher Ernährung, Ayurvedischem Kochen, und tibetanischer Medizin. Kochen, Singen, Musizieren, sich mit glücklichen Menschen umgeben und präsent im Augenblick zu sein sind einige der Dinge, die Loic gerne an andere weitergeben möchte, die sich für die gleichen Dinge interessieren wie er oder die einfach eine ähnliche Einstellung im Leben vertreten. The retreat center is located in Moraleda de Zafayona, Granada, Andalusia. The retreat venue, B&B Yoga Center Casa Bhakti, is situated in the beautiful area of Granada, Andalusia, and surrounded by the quiet sound of nature and the blending energy of the meditation and yoga retreats that take place. It is also located in the middle of olive and almond tree fields where you can do some nice walk. The nearest village is 1 hour and 15 minutes away by foot. There are some other amazing places you can visit while you are in here such as Cordoba (177 kilometers), El Chorro National Park (107 kilometers), El Torcal National Park (88 kilometers), Gibraltar (239 kilometers), Malaga (100 kilometers), Ronda (154 kilometers), and Sevilla (225 kilometers). You will be served with daily vegetarian and freshly homemade breakfast, light lunch, dinner, and snacks during the retreat. Breakfast will be served at 9.30 a.m. after the morning yoga class. In addition, coffee and alcohol will not be served in this retreat. Please book your flight to arrive at Federico García Lorca Airport (GRX). Transfer from the airport is included. B&B Yoga Center Casa Bhakti will pick you up from the airport. Another airport that is close to the retreat center is Málaga Airport (AGP) and then take an Alsa bus to Moraleda Empalme (1 hour 30 miutes). The closest bus station to the retreat center is Moraleda or Moraleda Empalme. There are trains from nearly everywhere to and from Granada, Antequera, Malaga, Madrid, or Barcelona. The closest train station is Loja San Francisco. Eine Reservierung erfordert eine Anzahlung von 36% des Gesamtpreises. Das Yoga Retreat Center Casa Bhakti bietet Unterkunft, gesundes organisches, vegetarisches Essen, Meditation und Yoga Retreats auf Englisch in der Nähe von Granada, Andalusien, in Spanien an.